As a Certified Financial Planner, I help people recognize and work towards achieving their financial goals. I help them with allocating their investments, charting their retirement income streams, and I teach them about the various ins-and-outs of financial planning. I love it. This is the nuts-and-bolts stuff we should all think about when trying to accomplish our financial goals. But today I want to zoom out to the big picture; to discuss what every single person wants from retirement: happiness. In my book, You Can Retire Sooner Than You Think, I talk a lot about happiness during retirement; this concept really is the backbone of my book. I did an incredible amount of research on the issue so I could talk about real-world happiness in retirement. Using a comprehensive survey, I asked over 1,350 retirees across the country questions about their own happiness. These were the hard questions that no one else was asking and the ones that needed answers. My goal was to plumb the depths of what makes the happiest retirees tick, so I asked the participants things like: How happy would you rate yourself on a scale from 1 to 5, with 1 being not happy and 5 being extremely happy. I asked lifestyle questions, like where they shopped, what kind of car they drive, and how many vacations they take each year. I also asked personal questions, like whether they were married, divorced, or widowed; whether they had children; how they liked to spend their time; and what they would say was their life purpose. Not surprisingly, I found that many stereotypes exist about what makes for happiness in retirement. Rule number 1 is that more money doesn’t always equal more happiness. While a fat financial cushion affords freedom and security, alone it is not enough to generate happiness. So, if fancy cars and expensive dinners and luxury yachts don’t pave the road to happiness, what does? The answer is layered. Let’s talk about how money fits in first. Certain financial signifiers kept popping up in the data. The happiest retirees lived in homes that were worth at least $300,000, and they had little to no mortgage debt left. As for planning, most happy retirees had a liquid net worth of at least $500,000, and they spent five hours or more each year planning for retirement. They also had between two to three different sources of retirement income, like Social Security or pension benefits, income from investments, rental property income and part-time work. What quickly emerged from the data was the concept of financially “living in the middle.” When it comes to home values, restaurants, cars and shopping, the happiest retirees have found a sweet spot in the middle. They don’t opt for low-rent, but they also aren’t always living high on the hog, either. Looking at lifestyle choices, the happy retirees keep their social calendars busy. Group activities like playing sports and volunteering ranked high on the happy list, while more solitary endeavors, like hunting and reading, ranked lower. As for family ties, the happiest retirees tended to have children – at least two, with three being a magic number of extreme happiness. In keeping with keeping busy, the happiest retirees reported taking an average of 2.4 vacations per year, while the unhappiest took only 1.4. You may be thinking to yourself, “Sheesh. It’s just a difference of one vacation!” But from my research, that one vacation made the difference between being happy and being miserable. Which brings me to what is perhaps the golden ticket to happiness during your retired years – “core pursuits.” These are the hobbies that you love and do often. One of the great joys of retirement is that it allows you the time and freedom to pursue these activities to your heart’s content. You can play golf four or five times a week, tutor disadvantaged kids, get your pilot’s license, travel the world, master a dovetail joint, or get that Ph.D. in medieval literature, all guilt-free. My research shows that the happiest retirees have 3.6 core pursuits; and most of these, if not all, are life-long hobbies and interests. So, what are your passions? How will you spend your new-found freedom? 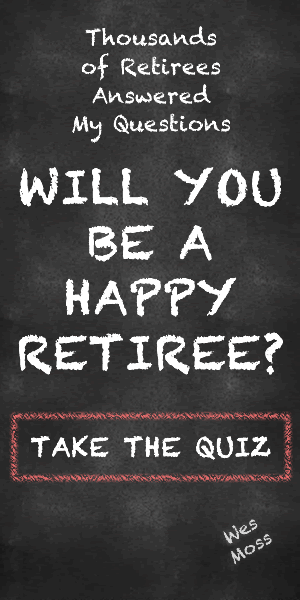 You might be surprised how many people headed towards retirement have trouble answering that question. I think this is a stumper for many folks because they have not (or will not allow themselves) time in their younger years to find and develop personal core pursuits. That’s understandable. Much of adult life is rightly devoted to work and family. It can be tough to find six hours on the weekend to play golf, or an evening to attend a continuing education class or 30 minutes a day to master the piano. But this is another place where investing over the years will pay off handsomely in retirement. Make time in your busy life to discover what makes you happy and pursue it. They will bring you joy in the moment, and in your post-career years. So long as you maintain a healthy balance, chasing your passions isn’t selfishness, it’s self-care. Remember, too, that some activities – golf, skiing and learning foreign languages, for example – are much easier to master when you are younger. Money is critically important to any retirement plan. But your stack of cash, no matter how big, won’t ensure a happy post-career life. That part is up to you. So, decide to be happy, and start taking steps to realize that dream. For more secrets of the happiest retirees, pick up my book, You Can Retire Sooner Than You Think.